We left Chicago around noon on Monday with our last group of trainees. I was on galley so I missed a lot of the leaving and sailing excitement that day. 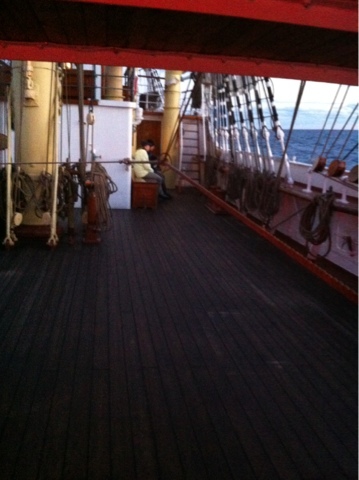 By dawn the next day about 80% of the volunteer/trainee crew were suffering from some degree of seasickness. We were less then 24 hours into the journey so there was still lots to teach but we just did the bare minimum to keep the ship going safely, letting people rest if needed, providing water and plain foods and comfort for those who were most miserable. (I'm sure you're wondering… it appears my body deals with seasickness by being extremely tired. Also I find it better to stare at the deck then the horizon.) By afternoon the seas had calmed some and everyone was looking a lot better. 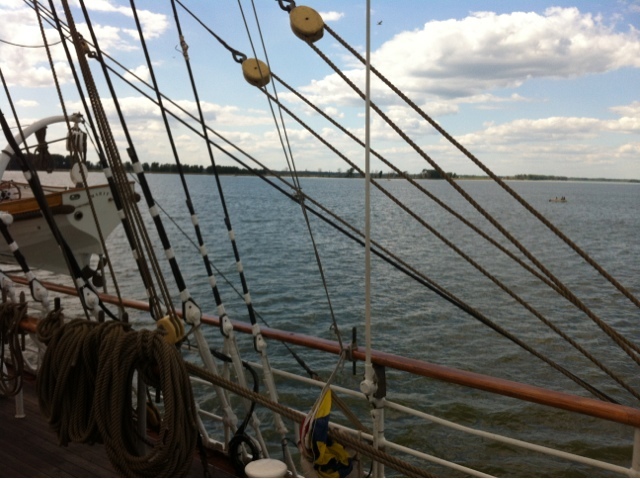 For the first time this summer we rigged safety lines (ropes to hold as you creep around) on deck. The following day was better again. People had colour and normal activities resumed. Thankfully the rest of the sail was smooth and we arrived in Green Bay safely. Overall it was a pretty uneventful journey. We got all the sails nicely furled as they won't be set again until after the new school year begins. We are all glad this is our last festival weekend. One last time looking at a field of tents, having our home open to strangers and answering the same old questions. Laura, I have been reading your blog all summer. Your adventure sounds amazing. It's exciting to see that you are following your dreams. What great memories you will have of this summer!